In conjunction with World Autism Awareness Day, we hosted an event called Paint for Autism on the 1st of April. We had the privilege of having Star Metro with us at the event. MORE than 300 participants joined the Paint for Autism campaign to paint an 81-piece puzzle artwork to celebrate World Autism Awareness Day on Sunday. Early Autism Project Malaysia aims to increase awareness and acceptance of the disorder among the Malaysian public. The process of painting by different groups of families also signifies the efforr of the community to support individuals with autism and their loved ones so they would be able to lead fulfilling lives. Early Autism Project Malaysia director Jochebed Isaacs said there was so much more that could be done to support individuals with autism and their families. “It begins with awareness, not only about what autism is and how we can help, but also the awareness of improved integration processes through schools, acting on policies that support these families, and our community role that gives hope to them. It is crucial that an attitude of kindness towards people with autism or people who seem different in general, is cultivated at a young age. Schoolchildren are the leaders of our next generation and teaching kindness will encourage a more accepting society. We hope that we can reach RM10,000 through the fundraising campaign, to provide more intervention treatment for people on the autism spectrum,” said Isaacs at the Paint for Autism campaign launch in Subang Jaya. Each participating group paid RM100 for a piece of 30cmx30cm artwork by local illustrator and children’s book author Emila Yusof. The campaign also provided an experiential maze that enabled participants to understand more about how someone with autism might feel in different situations and environments. The event included a children’s reading session with Subang Jaya assemblyman Hannah Yeoh who read My Brother is A Bear by local illustrator Hsulynn Pang. Yeoh said that many Malaysians were still ignorant about autism and many autistic people and their families did not know where to get help. “We need to continue creating more awareness among the public on autism. Early Autism Project Malaysia is doing the job and giving help to affected families. 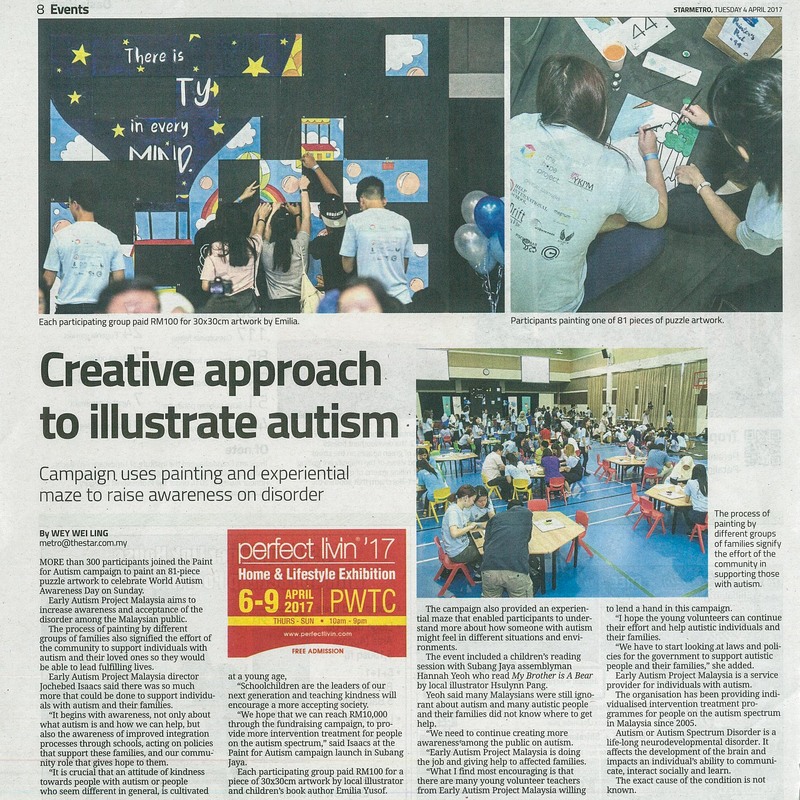 What I find most encouraging is that there are many young volunteer teachers from Early Autism Project Malaysia willing to lend a hand in this campaign. I hope the young volunteers can continue their effort and help autistic individuals and their families. We have to start looking at laws and policies for the government to support autistic people and their families,” she added. Early Autism Project Malaysia is a service provider for individuals with autism. The organisation has been providing individualised intervention treatment programmes for people on the autism spectrum in Malaysia since 2005. Autism or Autism Spectrum Disorder is a life-long neurodevelopmental disorder. It affect the development of the brain and impacts an individual’s ability to communicate, interact socially and learn.